Researchers in the UK and the US have inadvertently engineered an enzyme that eats up plastic. The enzyme is able to digest PET (polyethylene terephthalate) — the same material used in the ubiquitous plastic bottle that’s clogging up landfills, coastlines and oceans around the world. Amazingly, this discovery only happened by chance. Scientists from the University of Portsmouth in the UK and the US Department of Energy’s National Renewable Energy Laboratory (NREL) were examining the structure of a natural enzyme, Ideonella sakaiensis, found in 2016 at a Japanese waste recycling centre. This enzyme could already break down PET plastic — it just doesn’t do it very quickly. To understand how Ideonella sakaiensis evolved, the research team “tweaked” the structure of the enzyme by adding some amino acids, according to John McGeehan, a Portsmouth professor who co-led the work. They ended up creating an enzyme that worked even faster than the natural one. “Surprisingly, we found that the PETase mutant outperforms the wild-type PETase in degrading PET,” said NREL materials scientist Nic Rorrer. The modified enzyme, called PETase, can break down PET in just a few days — a stunning discovery that could help fight the world’s escalating plastic crisis. “After just 96 hours you can see clearly via electron microscopy that the PETase is degrading PET,” said NREL structural biologist Bryon Donohoe. As BBC News explained, PETase works by reversing the manufacturing process by reducing polyesters back to their building blocks so it can be used again. When you drink soda, water or juice from a plastic bottle, those bottles are almost never made from recycled plastic. Additionally, as the Guardian noted, the plastic bottles that do get recycled can only be turned into polyester fibres for carpet or fabric. 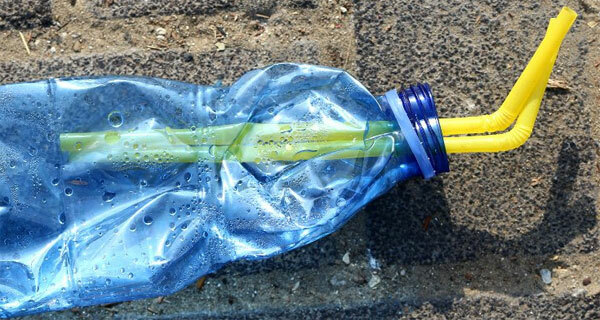 But this new finding suggests a way to turn plastic bottles back into plastic bottles. “They could be used to make more plastic and that would avoid using any more oil … Then basically we’d close the loop. We’d actually have proper recycling,” McGeehan told BBC News. The researchers are now working to improve PETase to see if it can work on an industrial scale. About one million plastic bottles are purchased around the world every minute, with that number predicted to increase another 20 percent by 2021. “This unanticipated discovery suggests that there is room to further improve these enzymes, moving us closer to a recycling solution for the ever-growing mountain of discarded plastics,” McGeehan said. The team’s finding was published in the journal Proceedings of the National Academy of Sciences.